This book takes into account three core policies: 'Every Child Matters', 'Personalised Learning', and 'Harnessing Technology', combined they are at the heart of changes to children and young peoples’ experiences of school. Harnessing Technology considers these policies and their interlinked relationship. 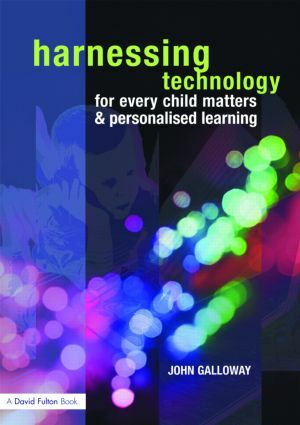 It outlines the ways in which technology allows us to assess, track and monitor pupil progress and use this information to better support both their learning and their broader needs, making it an essential resource for training and practicing teachers, school leaders, and all those involved in educational transformation. To achieve the five outcomes of the 'Every Child Matters' agenda requires an approach that is pupil centred, with developments in new technologies making it possible to not only understand each individual more precisely, but also for them to learn in more flexible and personalised ways. Through innovations such as web based information sharing, learning platforms and e-portfolios, schools will be able to offer content appropriate to pupil’s personal goals, breaching conventional orthodoxies of time and place. How far these policies will transform schools and services for children and young people remains to be seen. Consideration is given within the book to the barriers to their success, the issues that impinge upon them, and questions asked about their capacity to bring about long-term, systemic, change. What can the technology do for us?